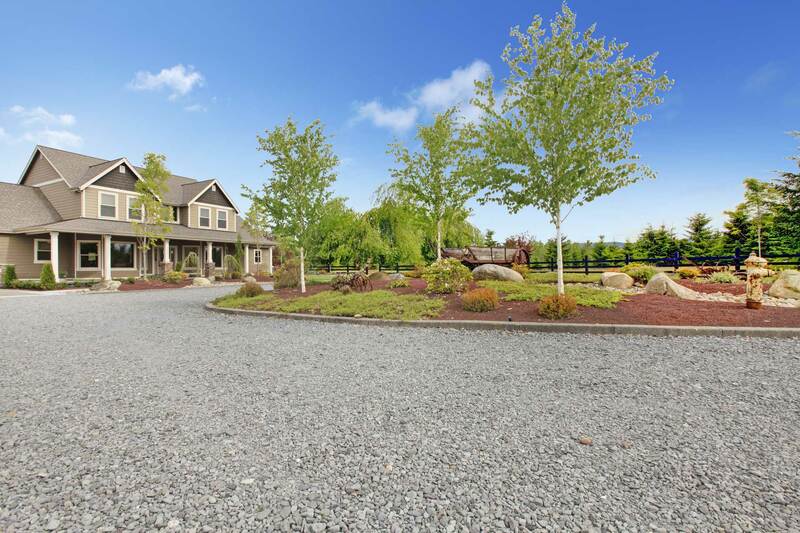 If a homeowner wants to build a perfect gravel driveway, even if he or she has no contracting experience, the project can be successful with a little planning and patience. In today’s tough economic times gravel driveways are increasingly being selected over others for a number of reasons. One reason is that material costs are usually lower for gravel driveways than they are for cement, stone and other types. Another reason is they are quicker to install and offer a variety of color options, allowing the homeowner to more easily customize the appearance of the entire property and add greater curb appeal. If you have the experience and confidence to tackle the project there are certain materials and tools will be important to have before you begin installing your driveway. The tools include landscape stakes, string, gloves, a wheelbarrow, shovel, rake, hoe, weed barrier, and gravel. The driveway needs to be well-installed from the beginning, therefore helping the property owner avoid extensive maintenance costs down the road. Before you begin your project, it is very wise to check with your local home improvement store or rock and cement manufacturer to see what types of stone aggregate are available to you–and at what cost. Aggregate is the crushed stone, gravel, or cement you will be using to make the driveway. Some of the most commonly used stone aggregate could be limestone, natural stone, road gravel, crushed asphalt, and crushed concrete. A basic rule for laying a good foundation for a long-lasting gravel driveway is that it needs to be three layers deep. The bottom layer of the driveway should be made of four- to six-inch wide crushed rock. The middle layer should be made of smaller, two- or three-inch stones, which helps the gravel from the first two layers to become more tightly packed. The third and top layer of the driveway will be the most important one to consider. This layer needs to be composed of five- or six-inch rock that is angular and rough, as opposed to smooth stones that will not stay in place as well. The rough stones of the top layer will also help all the layers be firmly packed-in and stable at the end of the project. Step One: Lay out the path of the entire length of driveway with stakes and string or twine. Remove the grass or ground surface from the path manually, which is very time-consuming. Another option would be to use a bulldozer or small backhoe to remove it. Step Two: Measure how many feet long and wide your driveway will be. Multiply the width times the length to get your square footage of stone needed (for example 12 feet wide by 10 feet long = 120 square feet). If you have trouble determining the right amount of stone to order, the stone vendor can help you with determining your final numbers without having to do further measurements. You would just have to know how deep you’d want each layer of gravel to be (four to six inches per layer is recommended as a general rule). Step Three: Schedule the delivery of each layer of your stone or gravel on different days, with about a two-day interval between each layer. Such planning will allow you time to spread the gravel and for each layer to settle before pouring the next one. If the gravel delivery company will spread it for you, it would be quicker and easier to take advantage of that service. Make sure that each layer of gravel is packed down firmly and is thick enough before adding the next layer on top of it. After the top layer is added, use a bulldozer to help compress the stones. The road to a perfect gravel driveway can be yours with a little planning, smart shopping, time investment and hard work. You will also add value to your property and improve its appearance after the project is completed.